HOW TO LEARN MORSE CODE WITH THESE VIDEOS? Gather some friends around your computer and find out who is the fastest decoding Morse code messages. These are online Morse code sound generators. 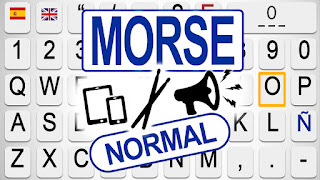 The easiest way to learn and practise Morse code alone or with some friends. Please, choose the interactive video that suits you best. Turn on your speakers and use the screen keyboard to send audible Morse code messages to the audience in your room. Every time you hear a dot, choose the white box and jump to the next row. Every time you hear a dash, choose the blue box and jump to the next row. The letter in the last box is the one that you are looking for. As long as annotations are not supported on YouTube Apps, you should watch these videos from a computer (web browser). ¡Thanks for watching and sharing!